Physical therapy for dogs (rehabilitation) is an important part of treatment for dogs with arthritis. This is Part 4 of my “Ultimate Dog Parents’ Guide to Arthritis in Old Dogs”. 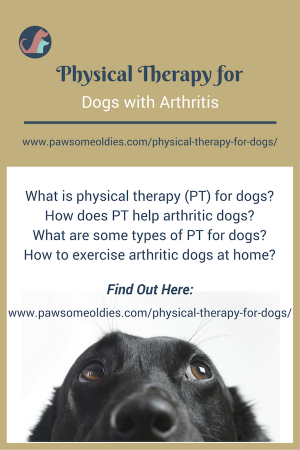 How does physical therapy help arthritic dogs? Physical therapy for dogs is usually referred to as rehabilitation. 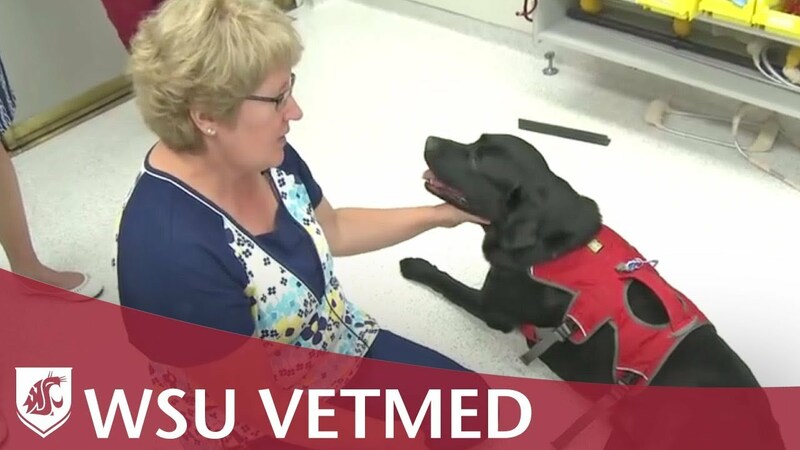 It involves using different ways and techniques to help the dog regain better use of their limbs, improve mobility, reduce pain, and to prevent or limit disability. Depending on the severity of arthritis, physical therapy for dogs may be just simple massage or stretching exercise, or it may involve advanced methods with sophisticated tools. The purpose of physical therapy for arthritic dogs is of course to strengthen the bones, joints and muscles, and to improve mobility so that they can enjoy a better quality of life. Strength training helps to prevent muscle atrophy. It also helps strengthen the muscle support around the joints, which in turn can increase the stability of the joints. Endurance exercises increase the aerobic capacity of the muscle, making it less prone to fatigue, so that the dog can gradually return to her normal level of exercise. The ability of a joint to move is called its range of motion (ROM). Arthritis causes a decrease in the ROM because of stiffness and pain, making it more difficult for dogs to do some activities such as climbing stairs. Physical therapy can help the dog regain the normal ROM and return to full function, with less pain and stiffness. Physical therapy for arthritic dogs can be divided into two types: Active (the dog has to actively participate in the therapy) and Passive (the dog doesn’t have to do anything). Cold therapy uses ice packs or cold packs to compress the sore joints. It is used if there is bleeding and swelling and to decrease pain and muscle spasm. Usually cold therapy is recommended after surgery or to treat muscle pain or soreness after exercise. Heat therapy uses heat packs, warm bath and so on to reduce stiffness, improve flexibility, and decrease pain. It is usually used for chronic inflammatory conditions (e.g. osteoarthritis). For example, in a dog with arthritis, heat may be used to help loosen tight muscles around a joint and improve flexibility. These exercises involve the therapist (or dog parent) moving the dog’s joints to improve flexibility and extension. They are useful because they provide controlled motion without stressing the joint. However, they have to be done properly! If you think your dog can benefit from these exercises, be sure to ask your vet to show you how to do them properly. Other passive form of therapy includes massage, chiropractic treatment, and stretching exercise. In aquatic therapy (e.g. 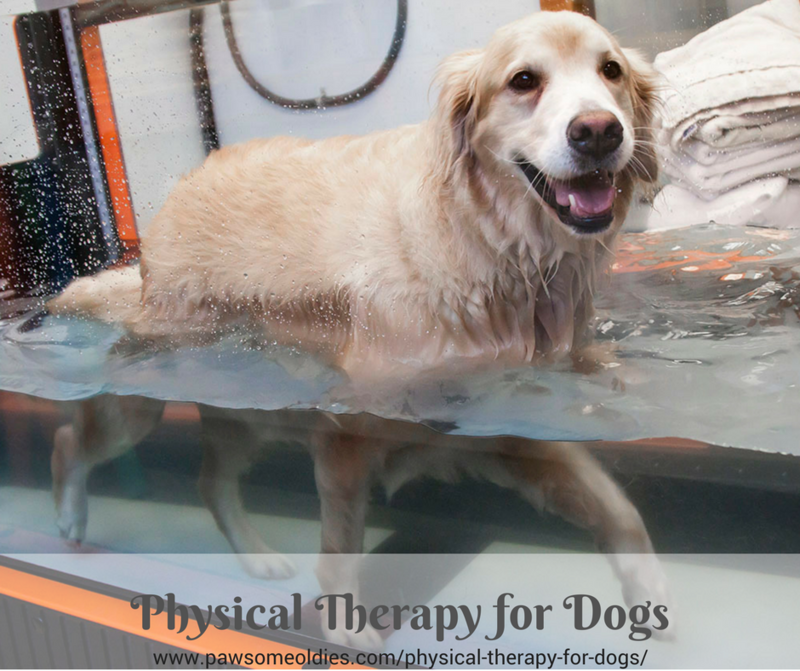 underwater treadmill), exercises are done in the water to help the arthritic dog gain strength, range of motion, and endurance. The benefit of exercising in water is that, the dog is able to contract his muscles without having to bear weight on them. This type of exercise is beneficial for dogs with arthritis, stiff joints, and muscle weakness. Controlled exercise can also benefit dogs with arthritis. For example, swimming is recommended for dogs who cannot bear weight on the joints while exercising. Work with your vet to design some exercises for your oldie depending on his condition. Does Your Dog Need a Professional Physical Therapist? Whether or not your dog needs a professional therapist should be based on your vet’s recommendation. Ideally, rehabilitation should always be supervised by a vet or therapist to minimize risk of injury. But sometimes, we have to factor in things such as convenience and expenses when making a decision. If your dog only needs simple therapy, such as massage or controlled exercise, your vet will certainly show you the right techniques and you can help your dog at home. 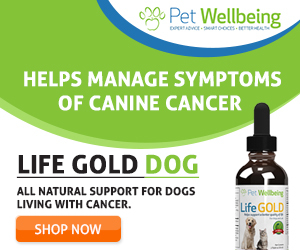 If your golden oldie is getting stiff and you would like to help him regain more flexibility and ROM, there are some simple exercises that you can do at home. The neat thing is, some of these exercises involve – get ready for this, Fido – the use of treats! So… it should be a great incentive for your oldie to get moving! Even if your pawsome oldie is suffering from joint pain or arthritis, it is essential that you keep her moving. Remember “use it or lose it”? Don’t let your dog walk too fast. The goal here is to gently move the joints without causing pain or further damage. If you notice that your dog is starting to limp, slow down further until she is walking more normally. Don’t pull on the lead, or allow your dog to pull. Pulling will prevent your dog from moving normally. Don’t be a weekend warrior. Instead of walking for 2 hours once a week on the weekend, aim at walking for shorter distances/time 4 to 5 times a week. Try to find different surfaces (e.g. grass, pavement, packed sand, carpet) for the dog to walk on. 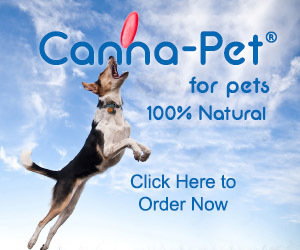 This can benefit your dog’s reflexes. Hold a treat at the level that your dog’s head will be when he stands. Ask the dog to stand. Put your dog in a “sphinx down” position. Hold a treat where your dog’s head will be when he stands. Put your dog in a “down” position. Use a treat to lure your dog to a sitting position by raising the treat above the dog’s head. Put treats on the floor about a foot apart. Lead your dog to walk slowly, sniffing the ground. This keeps the dog’s weight over the feet and encourages him to bear weight on both front feet.